Traveling in a camper van is the best way to enjoy a holiday in complete freedom. Had you ever thought about it? Are you 2 traveling hearts or a large family? A group of friends or are you traveling for work? Are you considering a CAMPER TRAVEL? 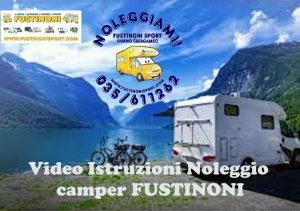 Choose a camper FUSTINONI DI CURNO that is either Van, Mansard or Semi-integrated! Contact us on 035/611262 for a quote or visit us in Curno. Driving requirements: all our campers can drive with a B license, the driver must have obtained the license for at least 2 years (minimum 21 years of age). The vehicle can only be driven by the lessee and by the drivers indicated at the time the rental is finalized. Minimum rental period: 3 days, 2 weeks in high season. Mileage: we do not carry out unlimited mileage, in each quote are included 200 km per day (weekend close destinations discounted rate 100 km per day). Additional kilometers € 0.25 / km. Duration of the rental: from 3.00 pm on the day of departure (unless otherwise agreed) at 12.00 on the day of return. No departures or returns on Saturdays, Sundays and holidays. From 15.00 on Friday to 12.00 on Monday for weekends. Fuel and supplies: The camper is delivered with the tank at level 1/4, 1/2, or 4 /4e and must be returned with the tank at the same level. Otherwise the landlord will take into account the fuel according to the current price list. Fuel and operating costs during the rental period are charged to the tenant. Rentals with delivery in a different place from that of the withdrawal will be possible only after special agreement resulting from a written document and payment for return to the site. The rates include: Veranda, RC Car Insurance, Casco Insurance with a deductible of € 1000.00, Green Card, Europassistance, VAT, Inverter, Water (100 lt). Reduced deductible (50%): the customer can halve the deductible by paying € 50.00 (for rentals up to 10 days) and € 100.00 (for rentals over 10 days ). Penalties: € 100.00 for lack of emptying of the exhausts, € 100.00 for lack of cleaning inside the camper. Payment conditions: 30% upon confirmation, balance 30 days prior to departure. Security deposit € 1000.00 by credit card. Discounts and promotions: -10% for regular customers, -10% for bookings 90 days before departure (excluding high season). Delivery, return: The tenant will be exposed to detailed instructions on the vehicle by the experts of the landlord, at the point where the delivery takes place. On this occasion a delivery protocol will be drawn up (Pick Up), in which the status of the vehicle will be described, which must be signed by both parties. The landlord may refuse delivery of the vehicle before the display of instructions. In case of delay in delivery due to the fault of the tenant, the resulting costs will be borne by the tenant himself. Final inspection of the vehicle: The tenant will be required, at the time of returning the vehicle, to carry out a final inspection of the vehicle together with the rental point employees, with the drafting of a return protocol (Drop Off) to be signed by the lessor and of the tenant. Any damage not noted in the delivery protocol but found during the return, will be charged to the lessee. Deposit to guarantees: To protect and guarantee the CORRECT USE OF RENTAL CAMPER by the lessee / client, at the departure he is required to issue, by credit card or bank check, a deposit of € 1000 (equal to the insurance deductible) for any internal or external damage caused by it. The deposit will be returned after the return and the final checks / cleaning of the camper, starting from the week following the return, upon payment of any excess kilometers or damages found. Vehicle deliveries will take place from Monday to Friday from 3 to 6 pm, refunds from Monday to Friday in the morning, from 9 am to 12 am. The times indicated in the rental contract are as agreed. On Saturday, deliveries and refunds can only take place upon agreement and against an additional fee. The day of delivery and return will be counted as a single day, provided that the total limit of 24 hours is not exceeded or is exceeded exclusively due to the fault of the lessor. Cleaning: The campers are delivered to the tenants with clean interiors and must be returned, from the latter, in the same state of cleanliness. Any subsequent cleaning operations that may be necessary will be at the expense of the tenant. – It will be required to pay an amount equal to 25% of the cost of the entire lease if the waiver were to be communicated before 30 days from the start of the lease. – It will be required to pay an amount equal to 50% of the cost of the entire lease if the waiver were to be communicated from the 30th to the 16th day from the beginning of the lease. – It will be required to pay an amount equal to the full amount of the lease if the waiver were to be communicated after the 15th day of the start of the lease. Send your request by email or Come to our Shop in Curno. – Camper with a maximum of 3 years of life. – The campervans are kept in perfect efficiency with regular periodic maintenance and always in undercover parking. – Thorough cleaning and sanitation of the camper vans. – Wealth of accessories included. – Many accessory kit available for a fee. – Transfer from and to the airports on request. Visit other partner sites. Have a nice Trip!